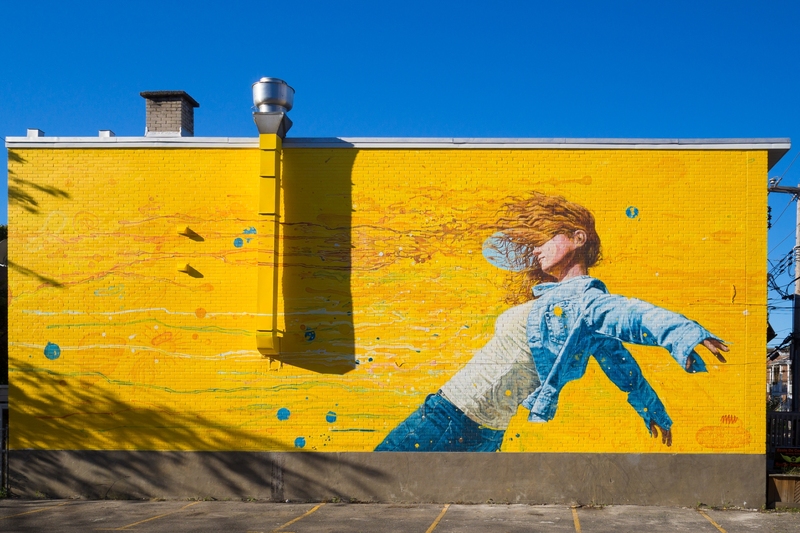 In 2014, MU and the St-Laurent borough collaborated for the first time with the creation of a mural on Beaudet Street, bordering the park of the same name. 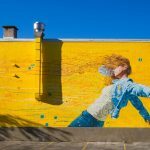 In an effort to pursue the integration of mural arts and the revitalization of the neighborhood, as well as to contribute to the vision of Quartiers culturels et des Promenades urbaines, a second mural has been initiated in the area. The wall is located at the heart of the future cultural quarter near the Musée des Maîtres et artisans du Québec, the Emile-Legault performance hall and the student residence. 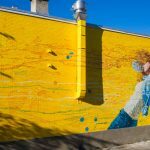 It is also located on the way between Du Collège metro station and Cégep de Saint-Laurent, an institution recognized for its artistic programs. In keeping with the first mural created by OMEN in 2014, the artwork is representing a female character, part of Rafael Sottolichio’s series entitled Engloutis. Fittingly, the artist is himself a fine arts graduate of Cégep de Saint-Laurent (1991-1993).